Murray McCormick grew up in Sudbury, Ontario, attended the University of Waterloo and in 1980 started working for the Simcoe Reformer. In 1982 he was transferred to Moose Jaw as the sports editor and in 1985 was hired by the Regina Leader Post. Murray started working as a Sports Reporter in 1989 where he covered all sports including curling. The first major curling event that Murray covered was the 1983 Provincial Women’s Championship in Moose Jaw. Murray didn’t have a lot of experience with curling before then but says he quickly realized that the social aspects of the game were a major part of the event. In 1991 he made his first road trip to Assiniboia to cover a Southern Men’s Playdown. Murray remembers that he wasn’t too excited about covering the event as he had never curled and felt out of his element. It was on that road trip that he was introduced to Bob Ellert, Bobby Corman, Gord Greenley, Jim Day and Chuck Pachkowski. Murray says he learned so much about curling in late night briefing sessions that he fell in love with the game. Since then he has covered 8 Briers, one world Men’s championship, six Scotties and two Women’s world championship. 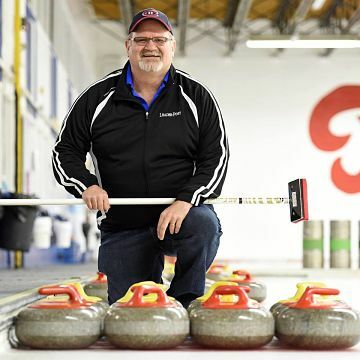 He has also covered countless men’s and women’s provincial championships, cash bonspiels and every other event that involves curling. 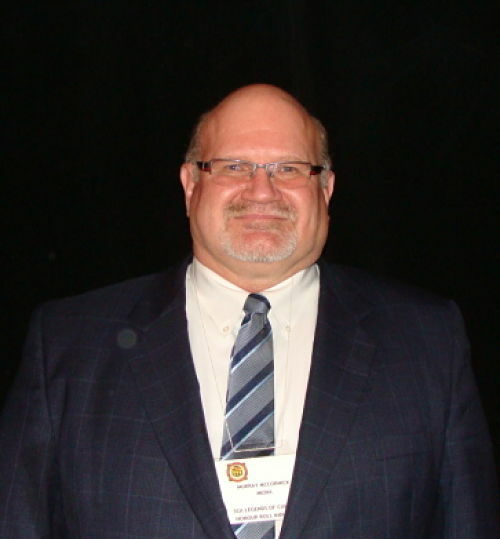 Through his extensive coverage of curling in the Leader Post he became the voice of curling in Southern Saskatchewan and in all of Saskatchewan. 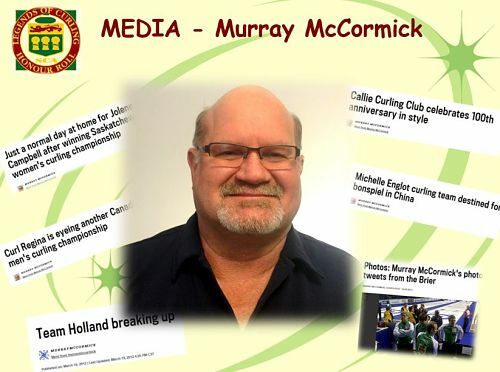 His weekly column “Hack to house” became a must read for everyone wanting the inside scoop on what was happening in curling in Saskatchewan and has always been a source of interesting stories about the curlers. Murray didn’t just write about the game of curling, not just about who won and who lost. He also wrote about the curlers. He told their stories. Stories about what it felt like to win or what it felt like to lose. Stories about overcoming adversity. That is what made his articles so important to our sport. Grew up Sudbury, Ont., attended the University of Waterloo and then started in 1980 with the Simcoe Reformer. In 1982, I was transferred to Moose Jaw as the sports editor. Stayed there until 1985 when I was hired by the Leader-Post as a sports copy editor. Moved to sports reporter in 1989 where I covered all sports including curling. Returned to copy editor after the 1996 Brier. Back into sports writing in 2001 and I’ve been there since. I’ve covered a variety of beats, but primarily golf and curling before taking over as backup Rider beat writer in 2007. Promoted to full-time Riders beat writer in August, 2008. That’s my primary beat with enough curling in the winter to keep me sane. Family: Married to Marian since 1982; three daughters – Megan, Mallory and Meredith and the world’s cutest granddaughter – Finnley. No awards and not much community involvement other than chipping in with Raise a Reader. First major curling event I covered in Saskatchewan was the 1983 women’s world championship in Moose Jaw. I didn’t have much experience with curling until then, but quickly realized that the social aspects of the game were a lot of fun. Prior to 2001, the curling beats were divided into the men’s and women’s at Leader-Post. I primarily covered the men’s side from 1991 through to 2001. In 2001, at my urging, men’s and women’s curling were combined into one beat. The 1991 season will always be special for because it was one of my first road trips to cover a southern men’s playdowns. I wasn’t too excited about the curling beat considering I had never curled and I felt out of my element. That road trip to Assiniboia changed all of that. I had a chance to meet Bob Ellert, Bobby Corman, Gord Greenley, Jimmy Day, Chuck Pachkowski and many others. I learned so much about the game while breaking down strategy and all of the politics involved during many late-night briefing sessions. It was also my first Brier in Hamilton, which Randy Woytowich should have won if not for Kevin Martin. I still feel that was the year that really convinced me that curling was a special beat. Since then I’ve covered eight Briers, one men’s world championship, six Scotties and two women’s world championship. I’ve also covered countless men’s and women’s provincial championships, cash bonspiels and just about every other event that involves curling. Personally I’ve never curled other than in the Saints and Sinners, where I think I’m undefeated (ha, ha). I’ve always worked nights, so that doesn’t allow a lot of time for curling. I’ve talked to many Saskatchewan curlers after winning Canadian championships, but I’ve never been on site for a national title. I’ve come close with Woytowich and Jan Betker. That remains my one regret on the beat that I’ve had that opportunity to write that championship story. I hope that it happens soon. The best part of the beat was being able to tell the stories of the curlers along the way. I’ve been told that I focussed too much on that aspect and I did, at times. I found their willingness to let me into their lives to tell others about their backgrounds and their stories, made the stories so compelling and significantly more interesting than writing about the games. Many of my favourite stories were about curlers overcoming adversity. The ones that jump to mind are Lyle Muyres returning to curling after the death of his brother; Michelle Englot battling through her dad’s death while representing Saskatchewan at the 2008 Scotties; back in 1995, smoking was banned on the ice and I remember writing about players dealing with that rule change; Amber Holland rising from a junior curler to one of the country’s best female curlers and the executive director of the SCA; The Mandy Selzer team winning the Canadian world junior championship; the many kids that I’ve written about whose parents I covered while they were on the playdown trail; any story from back in the day when a long-time curler finally qualified for the southern playdowns. Those stories always reminded me of how hard the game was and how cruel it could be. One of the most satisfying parts of my job was writing Hack To House. That weekly curling column kept me in touch with the curling world even when I had other responsibilities demanding my attention. Some of my favourite stories were covered in that column and I know many people looked forward to its annual return to the sports pages in October. I’ve been fortunate to travel all over the province covering curling and meeting some great people. Looking back, the people involved in curling have always been the best part of my job.